This is a quick-make refreshing drink that beats the sizzling heat. 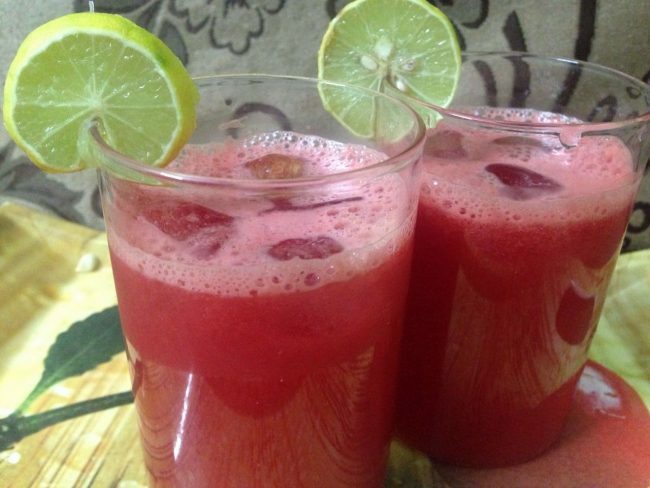 Black salt and lemon give it a kick and chilled watermelon juice cools your throat unlike anything else. When you feel the summer pulling you down, blend this concoction to rise back up. Perfect to be served to kids, family and guests. Blend until smooth. Then strain the juice through a strainer to separate the pulp and seeds. Then add the black salt and lemon juice into the juice. Stir to mix the flavors. Add 2 – 3 ice cubes to each serving glass and pour the ready drink on top. Garnish with a lemon slice and serve chilled.